Since the outbreak of Ebola, it seems as though we have not heard much about HIV/AIDS around the world. As one of the worst epidemics to have hit sub-Saharan Africa, HIV/AIDS has killed over 20 million people and has left an estimated 36 million currently living with the virus . In 1959, HIV (Human Immunodeficiency Virus) was first discovered in humans when scientists found a blood sample from the Democratic Republic of Congo that contained the virus . They hypothesized that this specific blood sample had been infected by the transmission of blood from a chimpanzee in the West of Africa . The human probably killed and ate the meat from these chimpanzees and was infected by the blood . Once someone is infected with the virus, they have it for life. The last and worst stage of HIV is AIDS (Acquired Immunodeficiency Syndrome), however, not everyone who has HIV will advance to this stage . 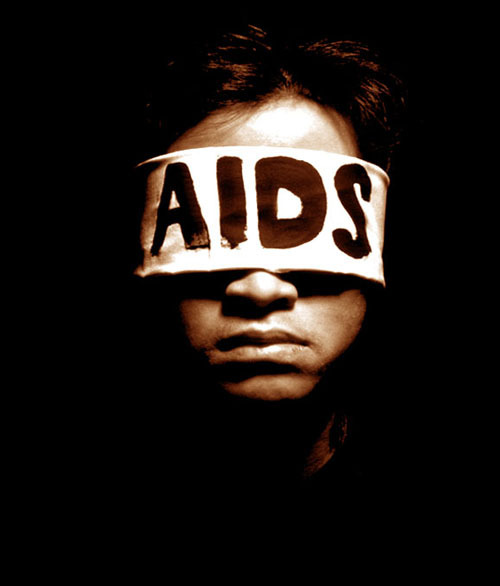 Once AIDS has developed, a person will last on average another three years. By the end of 2014, over 36.9 million people globally were living with HIV, of which 25.3 million were living in sub-Saharan Africa . 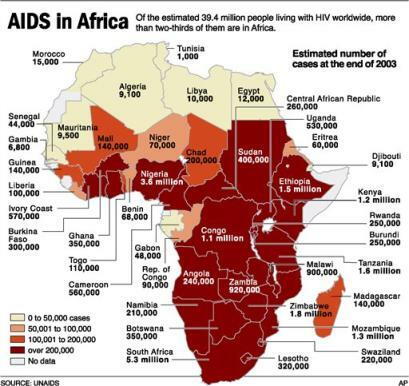 By 2000, Africa had accounted for around three-quarters of the global HIV/AIDS death toll . These numbers are absolutely frightening. Even with the discovery of medical treatments and therapy – antiretroviral therapy – there are still millions of people around the world who die every day because of this disease. It is important to explore the different aspects of society that are affected by HIV/AIDS and the outcomes that emerge as a result. The first and most evident aspect is human growth. It is no surprise that the emergence of AIDS has slowed down the increasing rate of human population, specifically in sub-Saharan Africa . “The average life expectancy in the South of Africa rose from 44 years in the early 1950s to 59 years by the late 1980s, but over the coming decades the impact of HIV will return life expectancy to under 45 years” . In addition, AIDS is responsible for one in five deaths, twice as many as for the second leading cause of death in sub-Saharan Africa . After human growth, households are the second aspect affected by the disease. 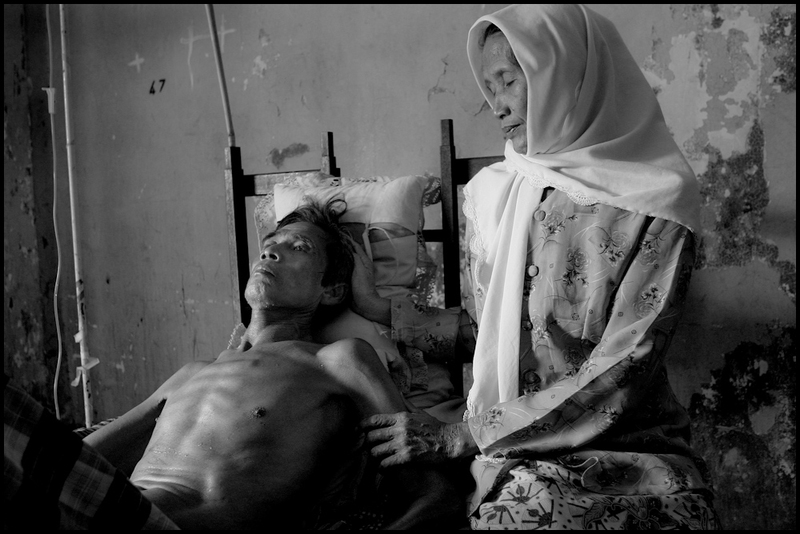 The moment HIV/AIDS affects a member of a family, the rest of the family and the community are also impacted. If the children are infected, then the parents must use more resources, money, and time to take care of their offspring. If the parents contract HIV/AIDS, then the children must be taken in by the community or by another family, once their relatives pass away. Depending on the number of affected individuals in a family, the remaining healthy members will need to take care of the sick, therefore leaving their job or education behind. Medical treatment, healthcare, antibiotics, special dietary needs, and even funeral costs are huge expenses that most families in sub-Saharan Africa cannot afford. Throughout the process, the illness and eventual death of family members will deprive the household of resources, labour, and further education. A burden is placed on the community as well. The poorer the households and communities, the worse the impact of the disease will be . Economic growth is the third aspect that is affected by HIV/AIDS. Infected HIV/AIDS patients or caregivers must quit their jobs due to the surrounding circumstances of the illness. Hence, there has been a decline in the labour force in sub-Saharan Africa since the emergence of HIV/AIDS . “By 2020, the workforce in 15 sub-Saharan African countries analyzed by the International Labour Organization will be 24 million people fewer because of AIDS” . As a result, there is lower productivity and higher payments for insurance and medical care. In turn, this will also affect the economy of a country. A perfect example would be South Africa: it represents 40% of sub-Saharan Africa’s economic output, which is expected to fall by 17% due to the economic impact of HIV/AIDS . The emergence of HIV/AIDS has left consequences on three aspects of society –demographics, households, and economic growth — and has also created another crucial problem: an increase in poverty. . Human growth rates around the world have been drastically slowed down, because of millions of deaths due to HIV/AIDS. Moreover, families must often sell all their goods, including cattle, furniture, and clothing, in hopes of saving enough money for medical treatments for the sick relative. Therefore, these families remain in poverty for many years until their sick family member passes away, and even then it takes years before they can recuperate from their losses. Finally, since many employers lose workers because of the disease, there is a relative decline in production, and a rise in payments for insurance and healthcare, consequently affecting the economy and its growth. As a result, poverty has worsened in the areas with the highest risk of HIV/AIDS. This disease creates a vicious cycle: HIV/AIDS exacerbates poverty, through three societal aspects: human growth, households and economic growth, which in turn accelerate the spread of HIV in a country . On a more hopeful and uplifting note, there has been an increase in the number of patients receiving medical treatment and therapy. In June 2015, it was recorded that 15.8 million people with HIV had access to treatments, compared to 13.6 million in June 2014 . The road to eliminating HIV/AIDS in the world is a long one, but at least the numbers show consistent improvement from year to year. Piot, Peter, Michael Bartos, Peter Ghys, Neff Walker, and Bernhard Schwartländer. “The Global Impact of HIV/AIDS.” Nature 410 (2001): 968-73. Haslam, Paul A., Jessica Schafer, and Jean-Pierre Beaudin. Introduction to International Development: Approaches, Actors, and Issues. Canada: Oxford UP, 2012. Print. Piot et al. 2001: p. 971. Whiteside, Alan. “Poverty and HIV/AIDS in Africa.” Third World Quarterly 23.2 (2010): 313-32. Piot et al. 2001: p. 972. Bonnel, René. “HIV/AIDS: Does it Increase or Decrease Growth in Africa?” ACT (2000): 1-25. Kathleen Rose is in her last year at McGill, majoring in Political Science, with a minor in Environment. Having travelled to over 28 countries, including third world countries, she is keen to learn more about International Development and Human Rights, and hopes to continue in Graduate school in those fields. She is an avid reader, a violinist for 14 years and counting, and an eager writer/reporter for numerous local Montreal newspapers.